Studio caricatures say a lot about the person. They make perfect personal gifts. If someone is retiring, changing jobs, having a baby, being promoted or buying a house what caould be more of a touching present? The artwork can include hobbies, habits, work and branding elements and more. 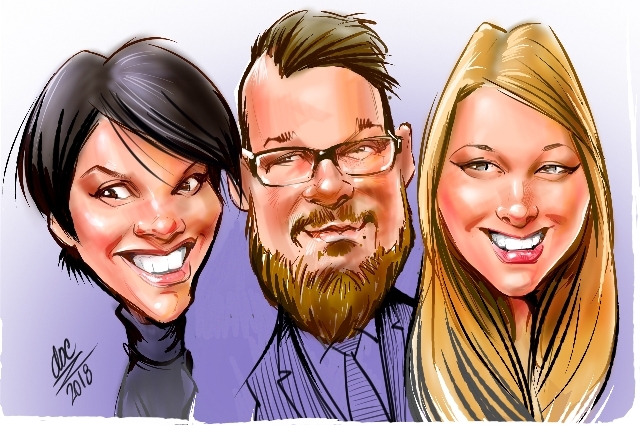 Custom caricatures are a big hit in Montreal and Quebec. The love of humor and sattire is strong in Montreal and we are here to produce the highest quality of personal caricatures for you. Caricatures make great logos and business identity. This is whynMaytag man lives on and in a timeless manner. A caricature logo is friendly and is liked by all age groups. We can create a studio caricature for you and develop your branding based on it. We have the technical expertize to develop the image files that work for you in screen or print media. We can have it ready to be printed on a car, side of a building, a key chain or laser etched on wooden boards. We can do it all for you from the innitial creative stage all the way to finished products. Click Here to start! You can order a quality Caricatures drawn from photos by our team of caricature artists and illustrators. All hand drawn and produced using superb art supplies in Quebec. Digital caricatures are created for your printing or screen usage. Studio caricatures are superb corporate gifts, wedding presents and more. Order a studio caricature in minutes and have it sent to the receiver`s address. Create a custom caricture right here in a few simple steps. We send you the original caricature painting. Shipping is free anywhere in Quebec!